Graduate student Kelly Rice is passionate about physical activity and healthy nutrition for kids and offers these creative ideas for parents and caregivers. 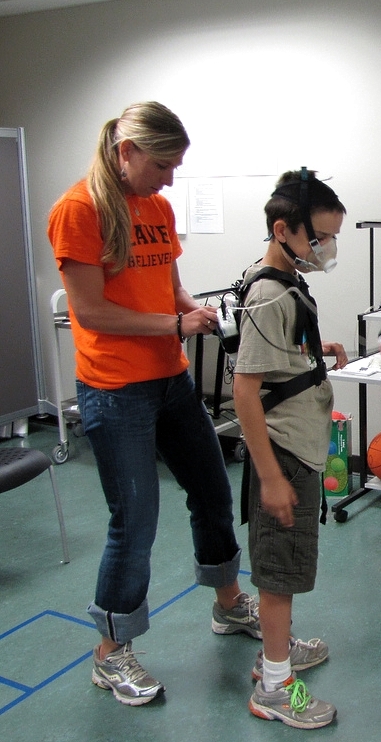 At OSU, Kelly works with kids on a study to determine energy expenditure in various activities. She’s earning her PhD in Exercise and Sport Science with a focus on physical activity promotion. •Design an obstacle course (inside or outside, depending on weather) using the portable play equipment you have around your house like jump ropes, cones, hula hoops, balls, and bats. •	Invent new games to play instead of watching TV – play board games, act out stories from books, movies, or video games, play hide and seek. •	Read The Very Hungry Caterpillar by Eric Carle and ask children to identify the healthy and unhealthy foods in the book. •	Identify one 30-minute sedentary activity on your schedule each week and replace it with something active – take a walk, plant a vegetable garden, pack a healthy picnic and walk to a park to enjoy it. •	Read Chicken Soup with Rice by Maurice Sendak and talk about how foods are associated with different seasons of the year. Serve chicken soup for lunch! •	Add activity to story time by having children act out the story. Try active games like running to collect paper spiders. •	Develop weekly themes around outdoor activities, like hiking, camping or sports. Invite children to help you invent games that fit with your theme. •	Work with the children to make a list of all the activities they like to do instead of watching TV then do these activities throughout the week. •	Make fruit smoothies with children using different types of fruit and milk. Let children taste the different flavors and talk about the importance of eating fruit. See more about OSU research on physical activity in daycare settings.